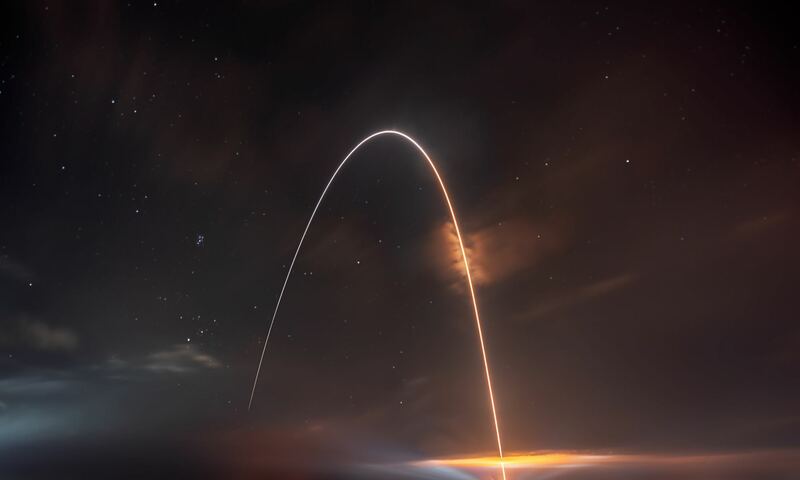 Caption: IRVE-3 was launched by a sounding rocket at 7:01 a.m. Mon., July 23, from NASA’s Wallops Flight Facility. Credit: NASA. A prototype for a large inflatable heat shield that could one day be used for landing large payloads on Mars was tested successfully on July 23, 2012, surviving a hypersonic speeds through Earth’s atmosphere. The Inflatable Reentry Vehicle Experiment (IRVE-3) traveled at speeds up to 12,231 km/h (7,600 mph) after launching on a sounding rocket from NASA’s Wallops Flight Facility on Wallops Island, Virginia. “We had a really great flight today,” said James Reuther, deputy director of NASA’s Space Technology Program, after the test flight. “Initial indications are we got good data. Everything performed as well, or better, than expected. Watch the video from the flight below. IRVE-3 is a cone of uninflated high-tech rings covered by a thermal blanket of layers of heat resistant materials. NASA said the purpose of the IRVE-3 test was to show that a space capsule can use an inflatable outer shell to slow and protect itself as it enters an atmosphere at hypersonic speed during planetary entry and descent, or as it returns to Earth with cargo from the International Space Station. A larger version has been proposed for landing larger payloads on Mars, such as future human missions. About 6 minutes into today’s flight, as planned, the 680-pound inflatable aeroshell, or heat shield, and its payload separated from the launch vehicle’s 55 cm (22-inch)-diameter nose cone about 450 km (280 miles) over the Atlantic Ocean. An inflation system pumped nitrogen into the IRVE-3 aeroshell until it expanded to a mushroom shape almost 3 meters (10 feet) in diameter. Then the aeroshell plummeted at hypersonic speeds through Earth’s atmosphere. Engineers in the Wallops control room watched as four onboard cameras confirmed the inflatable shield held its shape despite the force and high heat of reentry. Onboard instruments provided temperature and pressure data. Researchers will study that information to help develop future inflatable heat shield designs. A Navy crew will attempt to retrieve the aeroshell. IRVE-3 is part of the Hypersonic Inflatable Aerodynamic Decelerator (HIAD) Project within the Game Changing Development Program, part of NASA’s Space Technology Program.